The “Arab Spring,” a wave of unrest that began with the Tunisian revolution in 2010, reached Syria on March 15, 2011, when residents of a small southern city took to the streets to protest the torture of students who had written anti-government graffiti. After the Syrian government responded to the protests with force, demonstrations spread throughout the country. March 15 was the fourth anniversary of the start of the Syrian Uprising, which has since become a full-blown civil war, exacerbated by the rise of the militant Islamic State in the north and west of the country, numerous alleged human rights violations and a humanitarian refugee crisis. “Seven Days for Syria” is a list of small but significant tasks anyone can do to assist the millions displaced from their homes during the civil war, to show the Syrian people that they are not alone, and to remind world leaders that it is not too late to take action to help end the conflict. 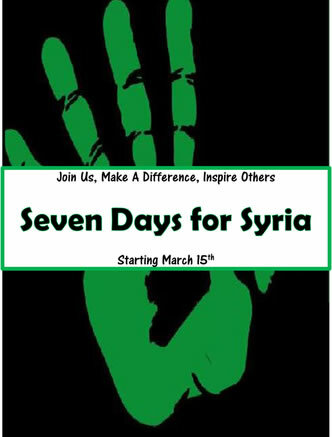 To find more detail about the tasks, listed in brief below, visit http://iamsyria.org/seven-days-for-syria. The campaign ends on March 21 with an exclusive free viewing of the documentary “Syria: A Fire Within,” a film human rights activist and I Am Syria President Ammar Abdulhamid helped to make. • Day One (March 15): Share the “I Am Syria” Video on social media. • Day Two (March 16): Sign a petition to your U.S. Senators encouraging them to support the Syrian Humanitarian Resolution of 2014. • Day Three (March 17): Know a teacher who might be interested in making a difference? Tell them about Teach Syria, a 40-minute Common Core-friendly lesson that provides the background knowledge and materials to engage their students in the issue. • Day Four (March 18): Make a $20 donation to the International Rescue Committee’s Fund for Syrian Refugee Relief. • Day Five (March 19): Sign up for Charity Birthday and instead of receiving gifts for your birthday, donate to humanitarian relief organizations such as UNHCR, UNHCR and UNICEF. • Day Six (March 20): Show your solidarity with the Syrian people by holding an “I Am Syria” image and taking and posting a photo. • Day Seven (March 21): Iamsyria.org will end its campaign with an exclusive free showing of “Syria: A Fire Within,” a documentary Iamsyria.org’s President Ammar Abdulhamid helped to make. Passcode: iamsyria.